Throughout Germany, the Schleswig-Holstein state capital is in an inglorious fourth place for nitrogen oxide pollution in the air, only topped by Stuttgart, Munich and Reutlingen (annual average 2016). This is largely due to traffic dominated by combustion engines. In addition to other measures to reduce nitrogen oxide emissions, the city is focusing on the expansion of electric mobility. In order to be able to expand the charging infrastructure for electric vehicles in a targeted and cost-effective manner, one thing has been lacking so far: an intelligent and flexible power grid. 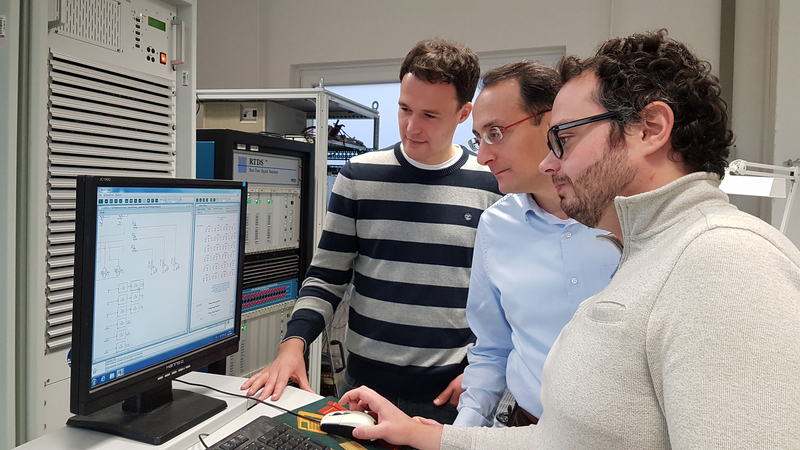 For Professor Marco Liserre and his team from the Chair of Power Electronics at Kiel University (CAU), the answer to this challenge is "KielFlex". The aim of the project, coordinated by the researchers, is to make Kiel fit for the electrical future in no time at all, i.e. by the end of 2020 – and it should be a global role model. To do so, a consortium consisting of Kiel University, ABB AG Mannheim, Fraunhofer Institute IFF Magdeburg, Kieler Verkehrsgesellschaft, Seehafen Kiel, the city of Kiel and Stadtwerke Kiel AG is transforming the entire city into a laboratory. By 2020, the Kieler Verkehrsgesellschaft transport company intends to integrate 36 electric buses into its own fleet and retire old diesel vehicles. In the future, all of the roughly 180 vehicles should be electric ones. There are already 15 electric cars on the road for Stadtwerke Kiel, and this year the energy supplier plans to convert 50 percent of its fleet to electric vehicles. In the short term, the company wants to produce around 45 tons less CO2 in this way. Electric cars are also becoming increasingly attractive in the private sector. In addition, there are investment projects by Seehafen Kiel GmbH & Co. KG to supply ferry and cruise ships with shore-based electricity during their layover in the port. There are currently 42 public charging points for electric cars in Kiel, and the municipal utilities are planning up to 200 more. The task of the KielFlex project, which is scheduled to run for two years, is to position these at strategically favourable locations in the city, such as the Stadtwerke depot, bus stops, taxi stands, car sharing points, multi-storey car parks and new apartments. From 2020, scientists have calculated that these measures can save more than 12 tons of nitrogen oxide emissions. © Denis Schimmelpfennig, Uni KielProjekt KielFlex: Markus Andresen, Marco Liserre, Giovanni des Carne (from the left) simulate Kiel’s entire power grid in the lab at the CAU’s Faculty of Engineering. © Denis Schimmelpfennig, Uni KielFor KielFlex, Xiang Gao and Marius Langwasser conduct research on the CAU’s own electric car and build a charging station on campus. © Stadtwerke KielOverview of the electricity network: The public electricity network of Stadtwerke Kiel comprises more than 3,500 kilometers. Before the system is tested in 2020 in a district in Kiel's city centre and its inhabitants become participants in the project, Liserre's team will simulate the flexible power grid solution in the laboratory at the CAU's Faculty of Engineering. A charging station for electric cars will also be installed on campus to explore the potential of voltage control. Where charging points are set up in the city, the researchers are currently coordinating activities with the city’s public utilities and transport company. EUR 6.5 million will be necessary for KielFlex, more than half of the funds (around EUR 3.7 million) has been raised by the project partners from the "Immediate Clean Air Programme 2017 to 2020" from the Federal Ministry of Energy. “In Kiel, over the past few years we have built up the expertise and networks required to considerably advance research into the transfer of energy solutions," says Marco Liserre. KielFlex, for example, benefits from inventions from the power electronics expert's HEART project, which has been running since 2014. In this project, the scientist is working on nothing less than implanting a new, intelligent “heart”, a transformer 2.0, into the power grid. The project that has now been started as a spin-off of this research should make Kiel a role model for a global solution to energy system transformation. This is also due to the fact that it takes into account public and private transport on land and water. “Important things will start from Kiel. As a model case for intelligent control of the power grid, the city can provide practical information that can be transferred to other municipalities," says Dr Ulf Kämpfer, Mayor of Kiel. Projekt KielFlex: Markus Andresen, Marco Liserre, Giovanni des Carne (from the left) simulate Kiel’s entire power grid in the lab at the CAU’s Faculty of Engineering. 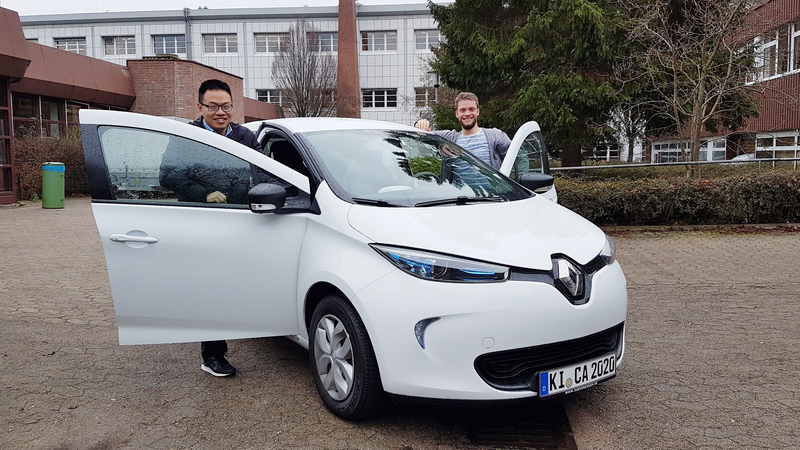 For KielFlex, Xiang Gao and Marius Langwasser conduct research on the CAU’s own electric car and build a charging station on campus. 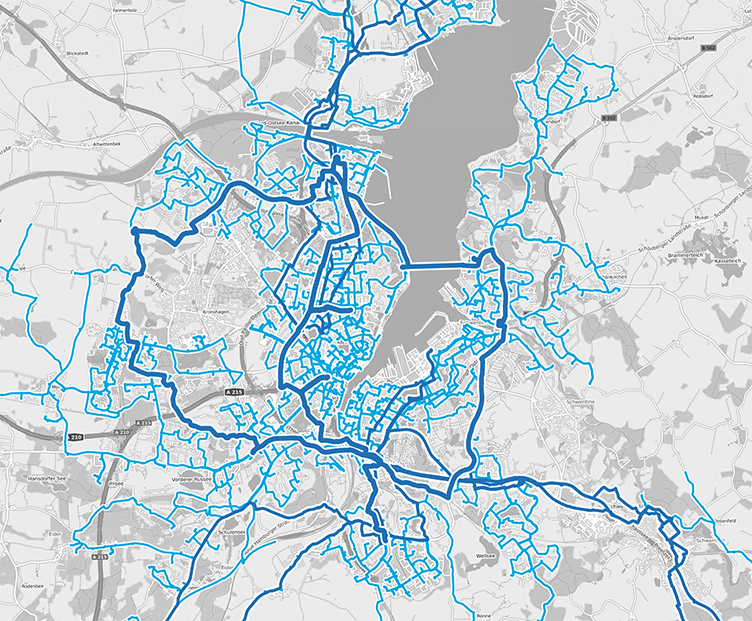 Overview of the electricity network: The public electricity network of Stadtwerke Kiel comprises more than 3,500 kilometers.